During the summer of 1967, the city of Detroit was rocked by civil unrest. Attempting to escape the violence and riots, Dramatics musician Larry Reed (Algee Smith) and his friend Fred Temple (Jacob Latimore) took shelter in the Algiers Motel. However, soon after, the motel was raided by Detroit police - in the mistaken belief that a sniper was firing from one of its rooms. Demanding to know the identity of the gunman and the weapon’s whereabouts, three officers then interrogated a group of residents - resulting in a night of horrific brutality and death. Beginning with an animated sequence that puts the Detroit riots into context, Kathryn Bigelow’s movie then reveals a city in turmoil. A black unlicensed club is raided, its patrons ejected onto the streets and bundled into police vans - much to the fury of an already hostile crowd. Anger soon boils over and the powder keg that is Detroit explodes once again into violence. With its use of archive footage, the start of Bigelow’s film has a documentary feel. We watch as shops are looted, petrol stations ignited. Such is the frustration of the city’s African American community that it is prepared to set itself on fire. Detroit’s police officers find themselves on the front-line of this war, tasked with restoring order. However, the vast majority of these officers are white and some, like Will Poulter’s Krauss, hold extremely racist views. Having started with this wide view of the city, Detroit slowly narrows its focus down onto Larry Reed - a man caught between his dream of becoming a professional musician and the nightmare of the riots. Algee Smith is superb in this role - his is a standout performance in an extremely impressive cast. Caught up in the chaos, innocent civilians like Larry Reed and Fred Temple flee to places of safety. However, just where can you hide when you fear the very people employed to protect you? Certainly not the Algiers Motel which, under Bigelow’s unflinching gaze, becomes a scene of absolute horror. I found Detroit’s lengthy interrogation scenes extremely difficult to watch - the atmosphere is as intense as the violence is brutal. The fear and distress felt by these men and women is palpable. Will Poulter is brilliant as Krauss - the police officer who drives the interrogation to new depths of terror. Poulter is careful to keep his character human, never allowing him to become a one-dimensional monster. That would be too easy a let off for this hideous man. We need to see his actions and understand the lasting damage caused by his shameful ignorance. Meanwhile, attempting to make peace at the motel, security guard, Melvin Dismukes (a powerful performance from John Boyega), finds himself unable to prevent the inevitable tragedy. It is awful to watch as his incredibly brave actions (made while many others looked away) result in utterly terrible consequences. 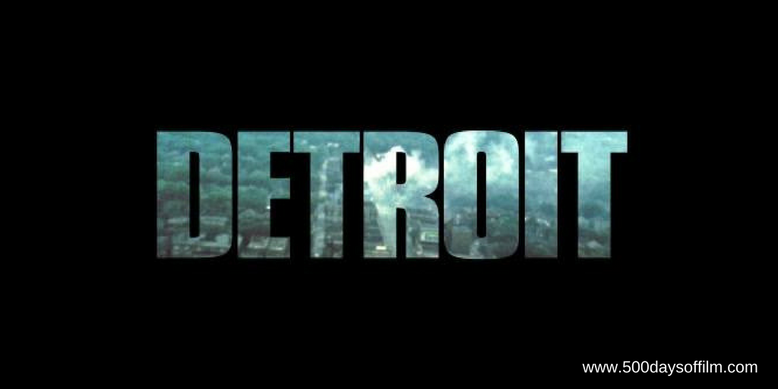 Having moved from documentary to horror, Detroit then turns into a courtroom drama. It is, of course, necessary to show what happened to the victims and explore whether justice was served. However, after the intensity of the events at the Algiers Motel, these scenes seem rushed and feel rather lifeless. As the final title cards disappeared (after reminding us that much of the film is based on well researched conjecture) and the credits started to roll, I felt exhausted and deeply disturbed by all that I had seen. However, I was also thankful for films such as this - movies that, while difficult to watch, remind us of important moments in history. For, 50 years on, perhaps the most devastating aspect of Detroit is how relevant Kathryn Bigelow's film feels today. If you have, what did you think of Kathryn Bigelow’s film? Let me know in the comments section below or over on Twitter or Facebook (@500DaysOfFilm).